Walmart on Wednesday announced it recently completed the nationwide rollout of in-house mobile payments service Walmart Pay, a system promised to one day support third-party digital wallets like Apple Pay. The deployment to more than 4,600 stores officially wrapped up last week after months of testing in pilot markets, reports CNBC. Walmart Pay was first integrated into Walmart's iOS app in December. 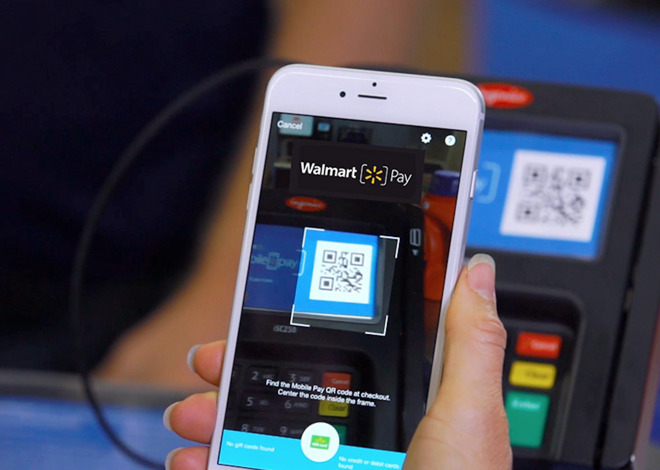 When the service launched seven months ago, Walmart VP of services Daniel Eckert hinted at future support for other mobile wallets, saying Walmart Pay is designed to handle NFC solutions like those marketed by Apple and Google. Eckert declined to comment on upcoming third-party integration during a media conference call today, adding that discussions with unnamed developers are ongoing. With a full rollout now complete, and no word on an expansion timeline, it seems the retailer has further entrenched itself against outside competition. Unlike Apple Pay, which offers a streamlined tap-to-pay interface, Walmart Pay transactions are completed by opening the app and taking a picture of a unique QR code generated by a point of sale terminal. The code triggers the app to deduct the purchase price from a credit card, debit card or preloaded gift card linked to a user's account. Customers have the option of using Apple's Touch ID fingerprint recognition module for added app security. While Walmart positions Walmart Pay as a plus for customers, touting payment flexibility, tools like shopping lists, and in-app receipt management, the company undoubtedly benefits from greater control over the checkout process (the solution is restricted to Walmart's own stores). Walmart's mobile payments sector ambitions began with its backing of CurrentC, a system designed to skirt credit card network fees by linking directly to user bank accounts. Beset with technical issues and a series of delays, that project effectively died in June, a month after Walmart Pay expanded to more than 750 stores.